Dad and I crossed the steamy asphalt, melty ice-cream cones in hand. We’d driven cross-country to Yellowstone for a nature-writing seminar and stopped at Mammoth Hot Springs for two reasons: huckleberry ice cream and piano music. The ice cream was a sure thing. The piano music, though? That was a different story. Randy played four or five nights a week and we weren’t sure this was one of them. It’s a stop I make every time I’m in Yellowstone. I heard Randy—or his music anyway—before I saw the piano that poured forth something different than his usual blend of catchy, pop music and original, Yellowstone-inspired pieces. It was something I vaguely recognized but couldn’t quite place. Dad and I walked through the lobby, its familiar surfaces festooned with greenery and bows that we weren’t used to seeing, toward the source of the music. Randy sat just inside the double doors of the historic hotel’s Map Room. He was wearing a tie. I’d never seen Randy in a tie. It was a Christmas tie. The song I’d recognized but couldn’t place? It was a Christmas carol. And the festooned lobby? Christmas finery. In August. August 25, to be exact. Christmas in Yellowstone. I’d worked in the park. I knew the story. Still, it caught me by surprise. How could Christmas in the high summer in the middle of a national park do anything but? I’ve thought a lot about that afternoon and about Christmas in recent weeks and I’ve decided that it isn’t only Christmas in Yellowstone on August 25 that catches me by surprise. Sometimes it catches me by surprise on December 25 when I’ve tried—and often failed—to live the season as though shopping wasn’t the only point. It catches me by the surprise on any day of any month when I’ve forgotten the whatever Very Important Thing I am engaged in isn’t the point, either. I think maybe Christmas is supposed to catch us by surprise. And it has a story all its own. There’s the king born in a stable. There’s the goodness of a God who reached down and offered undeserved grace and mercy to a rebellious people at great cost to himself. And there’s Jesus, whose sinless life, unjust death, and glorious resurrection gave us peace with God. If this is Christmas, how could it do anything but catch us by surprise? Anytime the magnitude of the mercy of Christmas breaks through the hard shell of our hurried modern lives, it is a marvel. So let it catch you by surprise. Let it take your breath away. Let it unfold, for it may well be holy ground. For you: If you would like a little audio encouragement delivered to you inbox to help you remember Christmas—no matter the season, I’ve recorded three short audios that you might like. Email me at natalie at natalieogbourne dot com and I’ll get you all set up. Natalie is a storyteller convinced that finding our way in wild places helps us navigate life in our domestic world. A mid-west dwelling wife and mom, she’s perpetually on the hunt for a cute skirt that will stand up to the trail. 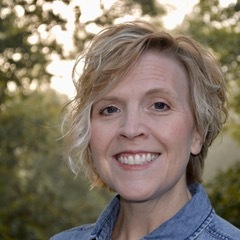 She encourages women to pause, ponder their path, and press on at natalieogbourne.com. Love this! The points at the end were so sweet, yet striking in their truth. 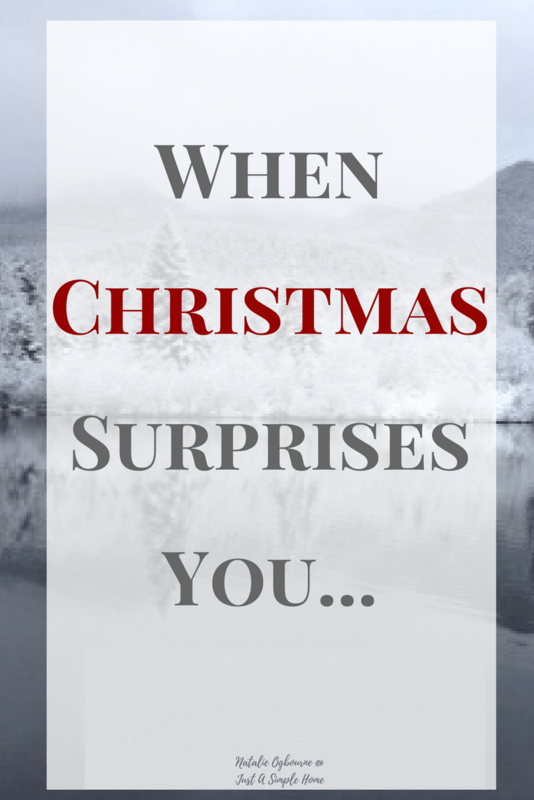 Christmas is special and a yearly “surprise” for so many reasons, and you highlighted the most important reason.